A site with information on the binary nature of the genetic code. 1st theory: The genetic information is stored and transmitted in a binary, digital format. 2nd theory: In protein synthesis, a highly sophisticated error correction algorithm is responsible for the accurate conversion of binary genetic data to physical molecules. 3rd theory: One binary input per binary output is error free; any other inputs that result in the same binary output have one or more errors. The first theory is simple to explain. As shown in section Going Binary, we can easily represent the DNA (our stored genetic material) with a binary code. We can also represent our mRNA, the data transmitted from DNA, with a binary code, in exactly the same way. To understand the second theory, we need to understand the concept of error correction. Error detection and correction mechanisms have been used in the recent years in digital storage and transmission systems. In our cells, the protein synthesis process is essentially a cellular 3D printing mechanism, where genetic information stored on our DNA becomes a physical product, an amino acid. When many amino acids put together, they form proteins. Currently, the fact that we only get 21 unique outputs (20 unique amino acids and a STOP message) out of 64 unique inputs, is attributed to a “built-in redundancy” which is called degeneracy. Given the fact that this cellular 3D printing mechanism has a step which requires transmission of information from the nucleus (where DNA is) to the ribosomes (where protein synthesis occurs), it is more likely to be subject to transmission errors. This suggests that there must be a built-in error correction mechanism which corrects them. 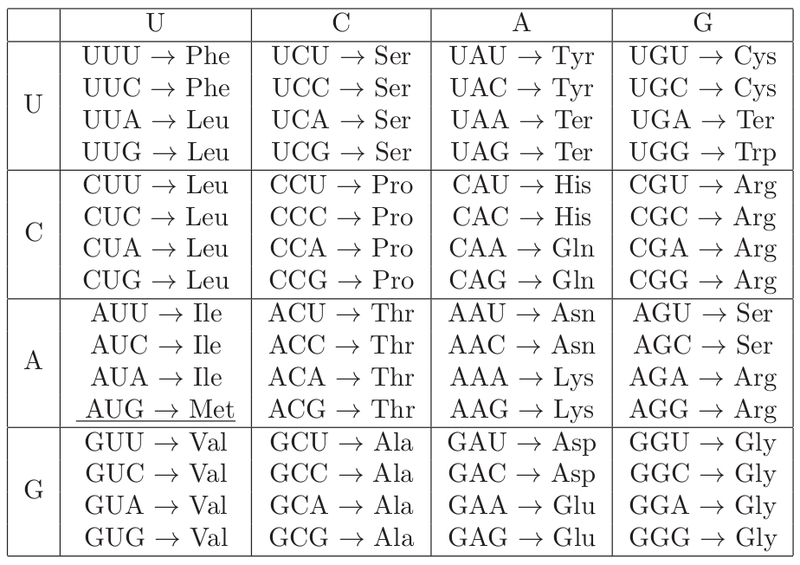 Here is the most common view of the RNA Codon table. More on Wikipedia. This view was selected simply because it groups together most of the codons that code for the same amino acid. In the section arkadian-algorithms I will explain how an error-correction code can explain the above table. The third theory will also become apparent. Copyright 2013: Dimitrios Mitsinikos - All rights reserved.